Anybody who’s ever been to an event in the South has had the standard meatball appetizer. It’s always a hit. Most people dump a bottle of chili sauce into a slow cooker with a jar of grape jelly and bag of frozen meatballs. My problem with this method is that it comes out way too sweet for my taste. I like a little sourness and heat in my meatballs, so I’ve changed the recipe slightly. I thought I’d finally write it down. This really couldn’t be easier. Just dump all the liquids into a slow cooker and mix well. You could use another brand of hot sauce, but Sriracha really works well here. Next, add the meatballs and stir to coat evenly (these bags of meatballs are larger than the standard Mama Lucia brand, so I used a bag and a half). Cook on low for three hours. It’ll seem like only half of the meatballs are braising in the sauce, but they’ll settle down into the liquid as they soften. Finally, set a bunch of toothpicks next to the slow cooker and watch the meatballs disappear. If you like the meatballs more spicy than sweet, then simply add more Sriracha. If you want more tang, then add more cider vinegar. Wow, this recipe has become a big hit on Pinterest. I have a dozen or so posts that have taken off on Pinterest and generate quite a few emails. Let me make a few comments that will hopefully clear a few things up. I usually use Mama Lucia’s brand of frozen meatballs. I only used the ones above because they were BOGO at the time I took the pictures. I usually use Heinz chili sauce, but I like to buy new brands from time to time to see if I like the taste better. That’s why there are two brands in the picture. A lot of people tend to think that Sriracha is exotic and they leave it out. That’s fine. You can use any hot sauce that you have on hand. But Sriracha isn’t exotic at all. It’s made in the USA and has a cult-like following. Oddly, it’s usually in the Asian section of the grocery store instead of near the rest of the condiments and hot sauces. I recommend that you give it a try. People have also asked what slow cooker I use. 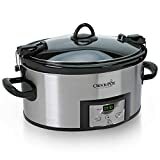 It’s 6-quart programmable Crock Pot slow cooker. I love it, but if I were to buy it again, I would go with the newer version that has a locking lid. That would make transportation to pot lucks and parties much easier. My friend always makes these and they are amazing! There’s never any left. Definitely go with the sriracha guys, I think you’ll be pleasantly surprised. I’m making them today for Christmas with my husband’s family. There’s a lot riding on these!